Weekly stroll can save your life, Chinese study observes : Healthcare Asia Daily News | Asia's Leading News and Information Source on Healthcare and Medical Industry, Medical Technology, Healthcare Business and R&D, Healthcare Events. Online since 2010. Researchers from northern Chinese Shandong University have reported in the British Journal of Sports Medicine that active people or frequent walkers had 18% lower risk of death as compared to full-on couch potatoes. Professor Bo Xi from the Department of Epidemiology at the university led researchers as they sifted through survey data from 1997-2008 on about 88,000 US citizens – recording the level of exercise against registered deaths. Heart-pumping, high-intensity activities such as biking, running and competitive sports were noted to be more time-efficient than moderate-intensity activity over the same period. Participants with two to five hours weekly – or segments of at least 10 minutes – of moderate physical activity such as walking resulted in a 31% reduction in risk of death from any cause, while 25 hours of exercise weekly almost halved the risk. However, for cardiovascular disease alone, the researchers have observed no additional benefit just by adding exercise hours. 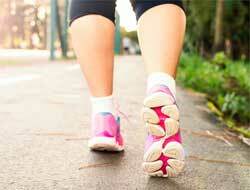 A brisk stroll once or twice a week is then recommended reduce the risk of dying from heart attack, stroke or cancer.